Behavior reuse is one of the key aspects of Object Oriented programming. Many mainstream Object Oriented languages, achieves behavior reuse by using class based inheritance. In class based inheritance, a class defines how objects stemming from it should behave. Here the �father� object acts as the prototype for �son�. Hence, �son� inherits all properties defined for �father� (Note the __proto__ property of �son� object was explicitly overridden to set �father� as the prototype). 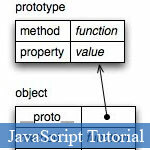 Even though it was used as a prototype, �father� object can be still manipulated as a regular object. This is the main difference of a prototype from a class. Let�s take an example of creating basic shape objects. The constructor takes the number of sides and vertices as the arguments. What if we want to create different types of triangles? Yes, we can use our basic shape object as the prototype for all our triangle objects. Basically, when you call a constructor function with the new keyword; it will set the __proto__ property of the newly created object to the object defined in prototype property of the constructor function.